Disclaimer: I work for HP Enterprise Services and any opinions expressed in this article are my own and not HP’s. 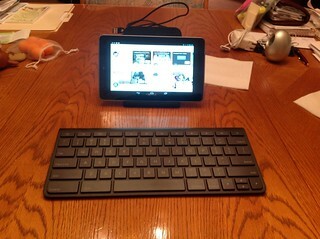 After reading an article this evening on how different bluetooth keyboards work with the new Google Nexus 7 I thought that I would try the HP Touchpad Wireless keyboard to see if it works with the Nexus 7. I was not too surprised to learn that the keyboard does in fact work, but what I was surprised to learn is that some of the special function keys also work. You might recall that last summer the HP Touchpad made a big splash by coming to market, failing to sell, HP deciding to cancel the product after barely a month, and ultimately selling the Touchpads for $99 each, much less than the nearly $500 original sale price. Besides the fact that the Touchpad ran webOS (which frankly I think is one of the best tablet OS’es that I have ever used) HP also provided some nice accessories including a wireless charging dock and a bluetooth keyboard. The entire combination of cradle, keyboard, and Touchpad provided the physical configuration of a desktop computer. I was so taken by the combination that I bought each when the prices went very low. The search button on the Touchpad Wireless keyboard works almost exactly like the physical search button works on older Android models. If you are in an app, for example Evernote, that has a built-in search function, pressing search on the keyboard initiates that search function. If a local search function is not available then pressing search on the keyboard starts the Android universal search. Another example of how the search button works is in Chrome. If you are in Chrome and press the search button the address/search bar is activated for you to either enter a url or a search term. Unfortunately the “back” function that appears to map to the messaging button on the keyboard doesn’t work consistently. In some instances it works, but it does not work in Chrome. I suspect that it might be possible for a developer to actually add mapping to the Touchpad Wireless keyboard function keys. 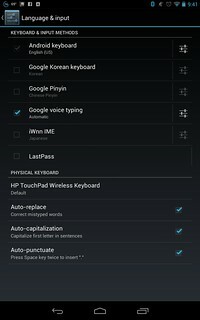 After pairing the keyboard to the Nexus 7 you will see a keyboard indicator on the notification bar and when you pull down the notification shade and tap Select Keyboard Layout you see the following screen. You notice that Android properly recognizes the keyboard and you even have the ability to change the keyboard layout that Android uses. Perhaps a developer could create a layout that properly programs all of the functions on the keyboard? One particularly useful function would be assigning the webOS card select button on the keyboard, which enables switching between apps in web OS, to the Android select button to make it possible to switch between apps using the keyboard. As far as touch typing on this keyboard, I think it is the same size as the keyboards that come on standard notebook computers. It is not a full desktop size keyboard, but I find the buttons spaced well enough that I can comfortably type on it. In fact, I have used the keyboard to write this article. If you are interested in buying one of these keyboards, you will find them on Amazon for less than $20. This entry was posted in Experiences and tagged accessories, Android, bluetooth, Nexus 7. Bookmark the permalink. All I did was enable BT on the Nexus 7 and turn on the keyboard. It was detected and works very well. I’m using it to type this. It’s nice to have the music player functions work, along with the volume keys (but not mute). The power button turns the screen on and off, which is nice. So only 4 don’t work: brightness – and +, keyboard, and mute.